We hunt the biggest rapids on the Shotover River, rafting where the Jet boats fear to go with a group of legendary raft guides from all around the world. For a real sense of adventure take a helicopter over the famous Skippers Canyon. That’s right jump in a Helicopter on Coronet Peak and fly through the canyon, right above the river you are about to raft. Gut wrenching drops in your stomach, pumping white water and thrills to last a lifetime await you and your crew. We offer an adrenaline filled paddle journey like no other paired with a thrilling helicopter ride dropping you at the start of the Shotover River experience. Meet our rapids, toilet, squeeze, jaws and Oh Sh*t to name a few before paddling the famous Oxenbridge tunnel right into cascade arriving back at base for a hot shower. Minimum age - 13 years. Weight restrictions - 40 kg to 120kg (weighing maybe required upon check-in). Under 18 years - Guardian conditions apply. Suitable for water competent people of moderate fitness. People with a heart condition or taking heart medication are unable to participate. Trip operates with a minimum of 8 people. Trips are weather, river level and/or water temperature dependent. Meet us 20 minutes before check-in at Go Orange Queenstown Rafting, 35 Shotover Street, Queenstown. It's Summer, we're excited, you should be too! Go Orange will be taking on the Shotover River for heli-rafting twice daily. The days are longer, the sun is shining and we are ready to face the rapids. Our prices have also changed, giving you the chance to save a few dollars, should you need to squeeze in another activity during your Queenstown holiday. Our trips are all half day trips, meaning we will have you back in Queenstown centre before you know it, exploring more of our playground. Bring your swimsuit and towel. It is advised that you don't bring any valuables with you. We do have a small valuables locker at Rafting Base if you need. Wetsuit, wetsuit jacket, spray jacket, paddle, helmet, wetsuit booties and a life jacket. Along with transport, rafts, legendary guides and guaranteed epic whitewater. Enjoy a hot shower and a cold beer (if you’d like) at Canyon Brewing Co.
Where does the experience start from? The whole experience will start at our Go Orange Shotover Street store where you check in. You will then be taken to the Raft Base at Arthurs Point to gear up. A shuttle bus will then transport you to the Heli -pad. Do I wear my wetsuit in the helicopter? Yes, after getting ready at the Raft Base we will transport you to the Heli-pad. There is a Heli-pad halfway up the Coronet Peak access road. Our van turns left down into Skipper’s Canyon but if you are flying in we will leave you there. In the Winter months the Skippers Road is closed so everyone will helicopter in from this spot. All of our experiences are weather dependent so depending on the weather gods you will be in the helicopter anything between 7 and 10 minutes. How many people fit in a Helicopter? 6 people can fit in the Helicopter plus the pilot. We will need at least 4 confirmed bookings for the Heli-Rafting to go ahead, otherwise you can hop on the bus! Do we take our paddles on the Helicopter? No. We will take care of all the equipment, you will only take with you what you’re wearing, so your wetsuit and spray jacket etc. Does the Helicopter carry in the gear? In Winter yes! We tie up the rafts, paddles and other equipment in a net that hangs below the Helicopter. In the Summer time all equipment will be transported down on the bus. Where does the Helicopter land? In the Summer time we land at Deep Creek to start the Shotover River rafting trip. In the Winter time, due to snow fall and conditions we start the trip further down the river and land at Boulder Beach. You will not get fed during your whitewater rafting experience. Please ensure you have eaten before the experience starts. You can also purchase food and beverage from Canyon Food & brew Co out at our Raft Base when the experience is over. We provide you with a 5mm wet suit, jacket, spray jacket and life jacket. You shouldn’t feel cold especially with all the paddling action, however if you are please let a guide know so we can give you hot water or an extra layer. What is the difference between the Shotover River and Kawarau Rivers? The main difference is the grade of rapids. The Shotover River is graded 3-5. Grade 5 is the highest grade commercially rafted in the world. This means heaps of excitement and a harder river to navigate. The Shotover River has more rapids compared to the Kawarau River, including a 170m long tunnel to navigate. We expect you to be a confident swimmer as there is a higher risk of falling out of the raft. The Kawarau River is usually graded 2-3 however can reach grade 4 at higher water levels. This river is easier with less risk of falling out. You also have the opportunity to jump out and swim a rapid on this experience and we have recently added a cliff jumping section. The Kawarau River is much deeper and bigger, flowing through some awesome Central Otago canyons ending with the 400 meter long Dog Leg rapid. Can I come if I can't swim? No, today is not your day to learn. We require water confident swimmers on the river. You may fall out and will be directed by our experienced guides to swim to safety. You will be given flotation jackets and wetsuits, but you will still need to be able to help the guides by moving towards the raft or the safety kayaker. Water confident – imagine yourself swimming in the sea with medium waves around you, if you can handle that then you should be able to handle our rivers. Do I need any previous rafting experience? No, you don’t. Everyone can enjoy rafting with zero rafting experience. We give you training and an extensive safety briefing before the experience starts. Our guides will also instruct you down the river to get you safely to the finish. Bring your swimsuit and towel. We have hot showers at the Rafting Base and lockers should you need to lock away any personal belongings. Don’t bring your cameras or high value items, they are best left at home. However, you are welcome to bring your phone and snap away before we leave for the river. We strongly recommend that you do. Peak season is busy, and space can be limited. If you decide on the day you want to take on the river, ring us or pop into the Shotover Street store to book on a experience. How can I book and pay for the experience? If you visit our website, you can book and pay using your credit card. You can also visit the team at 35 Shotover Street, our Go Orange hub and book in person. We will provide you with wetsuit socks and booties when on the river. You can wear normal shoes in and around the Raft Base. Can I wear my own clothes on the river? No. You are going to get wet and we don’t want you to ruin your outfit of the day. Bring your own swimwear and we will provide the rest. Please don’t wear cotton, it will make you cold. We give you a wetsuit, a jacket, a spray jacket and a life vest, if you’re cold we will have extra layers for you. Can I wear my glasses, contact lenses or sunglasses? Yes, you can, however please bring a sports strap or tie as we can’t guarantee the safety of your glasses without one. If you can do without, leave them behind. Nothing can be taken with you on the raft for health and safety reasons. Please don’t bring your camera equipment with you. The total experience time for both rivers is 4.5 hours. However, your time on the water can vary depending on the river speed, water levels and conditions. Our rafting shuttle will be waiting for you at base to get you back to town no matter the time you return. Where is the river and how far is the rafting from town? Our Raft Base is located on the banks of the Shotover River at Arthurs point, approximately a 10-minute drive from Queenstown. The Shotover River is found to the North of Queenstown. It will take us around 40 minutes to navigate the Skippers Canyon Road to the start point. You will then raft 14km of the Shotover River, through canyons and mountain terrain. The Kawarau River is the only outlet to Lake Wakatipu flowing east from Queenstown. We will drive for around 25 minutes passing Arrowtown to get to the rafting start point. The experience covers 8km of river, making its way through the beautiful Gibbston Valley. What is your experience capacity? We run experience with 8 or more confirmed bookings. The maximum number we can take down the Shotover River is 49 people and the Kawarau River 17. Given prior notice we can carry larger groups of up to 200 people on any one experience. How many people will be in a raft with me? The rafts carry a max of eight people including the guide. If you’re in a group, we organise that you will be seated in a raft with your pals. Is there a guide in the raft? Of course, we wouldn’t let you tackle our waters alone. Every raft comes with a qualified and certified raft guide, if you’re lucky you might get two! They will keep you safe and entertain you with stories and information about the areas as you go. Tipping is not expected in New Zealand. However, if you want to show your appreciation to the guides, that is at your discretion. A high five, handshake and stoke out will be enough for our guides – they love it when you have had an epic experience. Some medical conditions will prohibit you from rafting. It is VERY important that if you do have a medical condition that you let our staff know prior to rafting, this is not to stop you but to inform your guide, so they are prepared in the unlikely event that something does go wrong. If you need medication for you condition, e.g. asthma inhalers, you need to bring that with you. Can I raft if I am pregnant? No. We don’t offer two for ones on our trips and we don’t allow anyone who is pregnant on grade 3 or above rivers. P.S congratulations! Can I raft if I have a disability? This is assessed on a case by case basis. We recommend you call our staff and chat with them about your needs. With notice we are able to accommodate, however your involvement will be at the discretion of the trip leader and guides. Can I raft if I am under the influence of alcohol? No. However, your trip ends at Canyon Food & Brew Co, so you can try one of their delightful crafted beers and chat about your whitewater rafting adventure afterwards. It would be a pretty boring day if you didn’t, right? Yes, you will get wet, but you will have a wetsuit on so only your suit will. Whitewater rafting is epic in any weather, so if its raining, don’t be put off! What if I fall out the boat? Don’t worry, the guides are trained to deal with this. We also have a safety kayaker on every trip should you fall into the river. There is a full safety briefing before we leave explaining what to do should you fall out. In the shuttle bus yes! In the raft no, you will be instructed by your guide how to brace yourself when tackling the rapids. What is the age and weight limit? You need to be at least 13 year old to raft with us and a minimum weight of 40kg. There is no maximum age, we just ask you to be at a good level of physical fitness. The weight limit is 120kg. We do have a number of extra-large wetsuits and small ones for the kids. It will be at the discretion of the trip leader and guides as to who is eligible to participate. Do you raft the same rivers as the jetboats? We raft where the jetboats fear to go. We are on a totally different section of the river. You will experience different scenery as no jetboat or rafting is on the same stretch of river, except the 500m stretch after the Oxenbridge tunnel as you float back to the Raft Base on the Shotover River. 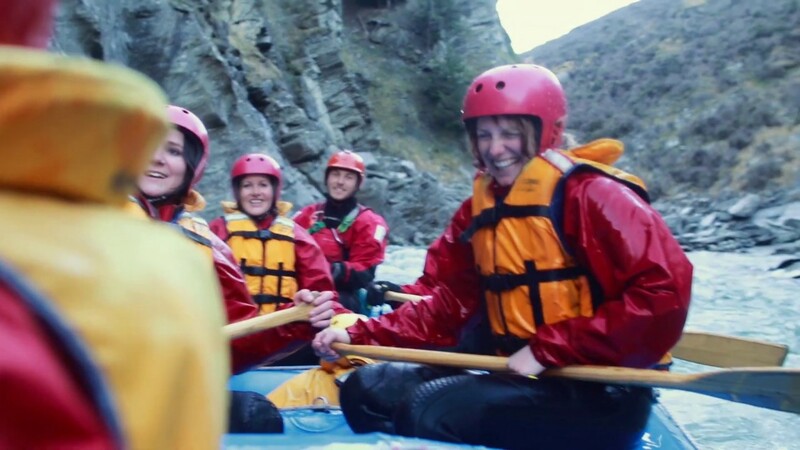 Queenstown rafting now offers a Jet to Raft experience, where you can Jet boat to the start of the Kawarau River experience. What a way to arrive right? Can we raft in winter? Yes! The Skipper’s Canyon Road is out of bounds so we Helicopter you in to the start of Shotover Rafting experience. The temperature of the water varies depending on the time of year however we will provide you with a full length 5mm wetsuit, that should keep you warm along with all the paddling action. Then we get a little wetter! Rafting experiences will still go ahead if it’s raining, the river is normally at its best when it’s raining. When is the winter season in New Zealand? New Zealand winter is between June and early September. So opposite to the northern hemisphere. We need at least 24 hours notice for cancellation for a full refund, after that a portion of the cost will be retained. The raft guides say, ‘We don’t pee in your clothes so please don’t pee in ours’. There are toilets at the Raft Base, please use them before departing for the experience. Can I buy some food? Make sure you have eaten before you depart on your experience and as much as we love snacks, you can’t bring them in the raft. Our Raft Base is shared with Canyon Food & Brew Co , so after your shower you are more than welcome to grab some food from there. They provide locally crafted on-site beers and a wide selection of food. Can my family and friends watch me rafting? We don’t have spectators on the river due to the remote location and nature of the terrain. There is an opportunity to stand near the last rapid on the Shotover River as you exit the Oxenbridge tunnel. Timings can depend on river levels so we can’t give your fans an exact time to be there.